The new version of ESET Smart Security is more powerful which provide productive defense against viruses and spyware, with easy interface, smart firewall , anti-spam technology, anti-theft and more . Smart Security 6 Firewall use a Self learning firewall technology to adapt to the user usage, and create firewall rules automatically, also the user can enter the advance mode for more firewall modes base on their needs. Protect and remove viruses, malware, spyware, worms, and more. Smart security will eliminate the spam with advance filters build into the software. Prevents fake websites from stealing your personal information and your credit card information. Threats can penetrate your computer from the portable media such as USB Disk-on-key, etc. ESET Smart Security 6 run a scan when you plug the device into your computer, also user can adjust the level of scan on removable media. Provides protection for unknown networks, including invisible mode for public Wi-Fi. Scans and blocks downloads before you install them. Ensures a faster scanning process that uses our online file reputation database for whitelisting safe files. Acts as a firewall to your application and blocks unauthorized changes to programs. Filters and blocks unsuitable website. Choose from predefined categories according to age of your kids. Prevents hackers from stealing your passwords. Access protection status and all frequently used actions and tools from any screen. In case of a security alert, enjoy one-click access to the solution. Customize your security needs. Define maximum scanning depth, scanning time and size of the scanned files and archives, and much more. 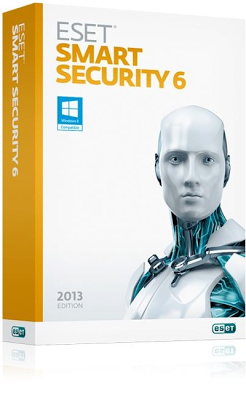 Allows you to access the gathered information via ESET Anti-theft. Initiates automatic monitoring of activity and displays position on a map based on the Wi-Fi networks in range when it comes online. Allows you to watch thieves via built-in camera and collect snapshots of the missing laptop screen. Offers a simple setup process and configuration options and help you increase the level of security by prompting you to modify key system settings. Allows you to send a one-way message to your missing laptop to increase the chance of its retrieval. Extending your security to Facebook, this app checks your profile and your friends' profiles for malicious links and harmful content. Installing security software is the first step toward cybersecurity. The second is educating yourself about safe Internet practices. That’s why ESET Cybersecurity Training is free with ESET Smart Security 6. ESET Cybersecurity Training uses real-world cyber-crime scenarios and gives you essential safety tips for making your online experience even safer.